I am a computer Technology Integrator and teacher at Kingswood Regional Middle School in Wolfeboro, NH. For many years I owned and operated Rick Davidson Photography and Video. 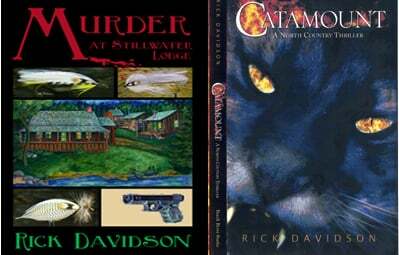 I'm also the author of "Catamount, A North Country Thriller" and "Murder at Stillwater Lodge". Curricula can be customized to meet the learning styles and life situations of individual students. Education can be freed from geographic constraint. Students can have more interaction with . . . teachers and students who may be thousands of miles away or from different nations or cultures. Parents can readily be included in the communications loop. Teachers can be freed from their tradition-bound classroom roles, employed in more differentiated and productive ways, and offered new career paths. Sophisticated data systems can put the spotlight on performance [and] make progress (or the lack of it) transparent. Schools can be operated at lower cost, relying more on technology (which is relatively cheap) and less on labor (which is relatively expensive). . . .
Information and knowledge are absolutely fundamental to what education is all about . . . and it would be impossible for the information revolution to unfold and not have transformative implications for how children can be educated and how schools and teachers can more productively do their jobs. . . . There is also a link to this in PDF form on the KRMS website. Go to “Our School” and click on the “Middle School”. W]e need to make “The Shift.” The Shift: to classrooms that are not solely teacher-centric, with the teacher as lone disseminator of knowledge and the children in the awe-stricken and lesser role of recipients of the knowledge. The Shift: where the teacher sometimes has the central role when he or she explains and coaches and elaborates on work to be done … but not always. The Shift: where the learners sometimes have the central role, either individually or in groups. The Shift: where the roles of teacher and learner are fuzzy; sometimes the teacher learns from the students; sometimes the students learn from one another; and, yes, sometimes the students learn from the teacher. The Shift: where sometimes it’s hard to know who has the central role, where activities are buzzing along, learning is happening, dynamics are shifting, and no one is “looking up” to anyone as the sole source of knowledge.Nothing jumpstarts The Shift quite like 1–to-1. Because when every student in the room has a [laptop], he or she does not have to look “up” to the teacher for resources or ideas – the student has resources at his or her fingertips. There is no distribution or retrieval of materials, no sole purveyor of information, and no firm start or stop to learning because it can continue beyond the classroom into the library, or home, or anywhere. It’s dangerous to educators who view themselves as the most knowledgeable person in the room and are personally invested in staying that way. It’s dangerous to teachers who haven’t paid attention to their unengaged students and keep covering the material anyway, they way they think it ought to be covered, believing students should adapt to their approach. 1-to-1 Learning: Laptop Programs That Work. How important do you think knowing how to use technology will be in your future? Are you good at it now? Explain. I think it is very important to know technology in the future. I am okay at using technology now. I think it is good to know technology in the future because it is going to be used a lot in the future and if you don’t know how to use it then you won’t get a good job. I think when I am older I will have to use a lot of technology but I am not so good with it right now, but I think I am getting better. Especially since we did this project. I think if you don’t know how to use technology in the future you are doomed. I think it is very important because almost everything these days has to do with a computer or palm pilots etc. I think I am good at using technology. I know enough to get by. I think that it is really important because you will have to use it for most jobs and you will have to use it in high school. Right now my understanding of technology is better than when we started this project. I think that knowing how to use technology is very important because everything is getting harder to use. I am not good with technology right now, if I saw how to do something over and over again, then I could be good at it. It will be very important to know how to use technology like this because the future seems pretty technologically dependent. I think knowing how to use technology will be very important in the future because it will become more advanced so you will want to keep up with it. Also, everyone will be using technology, and teachers will want you to do more assignments on the computer, I am not very good at it right now because it confuses me sometimes, and I’m not very patient with the computer. Sometimes I rush and stuff doesn’t get saved. I think that knowing how to use technology is very important for my future because I would like to go to Brewster Academy and they use computers for homework when it is assigned. It wouldn’t be good if I didn’t know how to use technology because I would not be able to do my homework. I would also be helpful for when I go to college. I think knowing how to use technology is very important for the future because I’m sure that I will need something like this again in the future. I think I’m pretty used to it now and I think that makes me good at it. I think that being able to use technology will definitely help in the future. I think you need to know how to use it because you will use it for many different things, like typing papers for school and work and there are many jobs where you will need to use a computer. I am good at using a computer now because I am a very fast typer. I know how to use many programs including Microsoft Word, Excel, Moviemaker, the Internet and other programs. I also can usually figure out how to do things and how to fix things on a computer too. I think it is very important to know technology in the future. I am okay at using it now. I think it is good to know technology in the future because it is going to be used a lot and if you don’t know how to use it then you won’t get any good jobs. Knowing how to use technology not only prevents silly mistakes like deleting something so knowing this, my next project will come out better and faster. Technology also speeds up the project. I did not know how to use technology so I made a lot of mistakes proving I’m not very good with it. Well I think that using the computer to make a movie is good for us. It will help us in future projects in high school or whenever we need to use a computer. Most likely everything in the future will be hover cars and robots. Technology will be important. Right now, I think I’m pretty good with it. I use the computer a lot so I know how to work with one. I think it is very important because we wouldn’t have been able to do anything on this video without technology knowledge. I think making this video taught me a lot about technology that I didn’t know yet, like how to convert videos. I think that being able to use technology will be extremely important in the future because technology like computers are able to tell you everything that you need to know. No, I am not very good with any technology but video games. I don’t really know how to make a decent movie off the top of my head because I ‘m not sure on how to download and upload things without assistance. Using technology is important because most of the jobs out there now involve working with computers. It will be very important because technology is getting so advanced. Yes I am good at using tech. I know how to now make a movie and now I can do a lot more on the computer. I think technology abilities will be very important because eventually that will be all there is. Currently I ‘m pretty good with a computer. When I go to college, technology will be in common use helping me with my studies. With papers and notes to take, (and my handwriting not being that good) it’s the only way to make sure my work is presented well. Not only in college, but when I get a job, most likely an engineer, use of a computer and machinery is a key essential, so I better start learning the basics. Yes I do think I am good at it now for my grade level, but I’m only at the tip of the iceberg. There is much more I need before I can call myself a pro. I think knowing how to use technology is extremely important for the future. You will probably be using it everyday depending on your job. I am good at it but I have a lot to learn. Being able to use this technology will most definitely come in handy in the future for personal and business projects. I do not think I am very good at making videos or using technology in general. I have good, effective ideas, but I’ve always had a bit of a problem when it came to computers, sometimes it was the computer and sometimes me. Either way, things never seemed to work out the way I would’ve preferred them to. I think technology is pretty important now because it makes a lot of difficult things very easy. I think it will be very important in the future because it’s improving every day and soon people are really going to rely on technology to get things done. I think I’m ok at using technology. I’m not a tech wiz or anything but I’m good enough to get by. I think it’s important to know how to use technology in our age. Seeing as our age is known as the technological age it should be second nature how to use most technological objects. I’m not half bad at using our technological these days seeing as I use my computer almost everyday and technology like a calculator and objects like that. Course Description: We are living in a technological world. Technology is changing the way we do just about everything. It is certainly changing the way we learn and the way we think. It is changing the way we research and the way we communicate. It is extremely important for students to develop the skills necessary to make use of all of the ever-changing tools that are now available to them. Using a networked computer lab, this course will help students to learn to use the Windows 98 operating system. It will also help students work effectively with file management, word processing, spreadsheet, database, desktop publishing, basic layout design, basic web page construction, digital photography, multimedia, Internet, and graphics. Since computers are becoming part of every school curriculum, student’s computer use will use concepts that apply to math, history, science, grammar and spelling. Students will learn the principles and vocabulary of computing. Emphasis will be placed on how computers can help the students in their day-to-day lives. In class projects will stress the importance of problem solving and all aspects of computing in the creative process of publishing on the computer. Students will also be encouraged to evaluate their work themselves. They will also be expected to improve what they have already done and to repeat their work until a quality product has been created. The concept of quality work will be stressed. In fairness to students who do not have access to computers outside of the school environment, homework assignments will not include computer work. However, non-computing assignments may be an on going part of in-class computing projects. Classroom projects will count very heavily in the grading process. This class will be a “hands on course.” The students will be regularly working on projects in the computer lab. Many may find that they will need to spend extra time in the computer lab. There will be on going quizzes on covered materials and concepts. Some quizzes will be announced. Some will not. Rational: Students today need to understand how to work with computers. Computers have become necessary tools in every walk of life. The ability to use a computer has become as important as the ability to use a pen or a pencil. Students with well-developed computing skills will experience more success both in school and in later life. The computer is much more than a typewriter. The computer encourages the acquisition of data, the assessment of that data, and the assessment of the presentation (output). Total computing encourages the composer to use many different applications to evoke the desired response in his or her publication. Indeed the type written page is no longer the standard of a good presentation. Today we may easily incorporate, drawings, photographs, charts, graphs, maps, video, and music into our publications. Publication on the computer has become synonymous with performance. The assessment and problem solving process that accompanies the desire to perform well is desirable, creative and educationally productive. It is also important that students realize that the computer can be a great tool for helping them complete quality work. Guiding Principles: Each student should begin to develop his or her ability to work on various aspects of computing. They should also learn how to begin to intuit the functions that are common to all applications within a given operating system. According to state guidelines, each student must show proficiency in word processing, spreadsheets and simple database. It is also important that students be exposed to, not only these skills, but also the wide variety of applications that are available to them. Students should be encouraged to use all aspects of computing in the process of learning to publish on the computer. The process will involve research, assessment, and publication. The student’s will be encouraged to evoke a desired response from their audience. The creative use of the computer can increase skills in all areas, including math, science, grammar, spelling, writing, reading and overall creativity. The ability to save and improve upon work is an important aspect of creating a quality product. Outcomes: Students will demonstrate an ability to work on the computer. They will display an ability to work with operating systems and file management. Students will show competencies in various computer applications. They will also demonstrate an understanding of basic computer theory and vocabulary. Working with computers will become a lifetime endeavor. Students will have built a foundation on which they can build in the future. The greatest outcome will be reflected in the students ability to creatively problem solve and effectively choose, use and combine the tools that will assist him or her in publishing his our her best work. Evaluation: Evaluation will be based on the quality and creativity of completed projects. Tests and quizzes will count, but the goal of this course is to encourage students to understand the value of the computer as a tool that can be used creatively in just about every area of their academic and non-academic lives. The student’s willingness to participate in projects will be taken into consideration. Class participation will count very heavily (see-weighted grades). Grades will also be dependent on the student’s willingness and ability to improve upon work that has already been done. Students should be able to continue to rework their projects until their best quality work has been created. Required materials: Each student will maintain a folder containing in class notes, projects, handouts, test, quizzes, and grade receipts. Students will be allowed to use all materials in their folders on tests, quizzes and on going projects. Copies of other student’s materials are not allowed. Grade Rubric: Every project will be presented to the instructor with a grade rubric. Students and the instructor will establish criteria for quality for each project. Once these guidelines have been established, a specific rubric will be created and used to evaluate whether the students have achieved their self-initiated goals. Monday we will review the formatting of “Works Cited” and students will check the citation page for their research projects on thinkquest.com. This week we will begin a unit on spreadsheets. This will include graphing, creating a budget, setting up an order form, tallying grade averages and managing a simple database. There will be a thinkquest.com workshop on Monday Ocotober 20 at 2:30 PM is the KRMS Computer Lab.